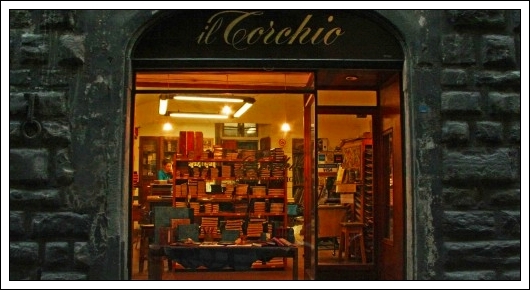 When you cross the Ponte Vecchio, and leave the cacophony of central Florence behind, you enter a world apart. This is the Oltrarno, the south side of the city and its creative center. Small workshops line narrow lanes. Borgo San Jacopo, a shady narrow medieval street, leads west away from the Via Guicciardini, Via dei Bardi leads east to shops as varied as high end hand crafted jewelry to Il Torchio, a book press whose owner creates gorgeous leather bound journals and multicolored Florentine paper. Along the Via Santo Spirito, just past the south end of the Ponte Santa Trinita is the small workshop of Ippogrifo, where a couple create gorgeous etched copper prints. See my blog post about Ippogrifo. It was in the fourth or fifth century that the first church structure was built on the site of present day Santa Felicita. Dedicated to St. Felicity of Rome, the building was to go through several expansions, reductions and redesigns over the course of the next thousand years. Within the, now, 18th Century interior are works by Taddeo Gaddi, Pontormo, Francesco d’Antonio and Neri di Bicci. While many art historians discount the comparative value of the frescoes and painting in the church, this is a rarely visited treasure of Florence. Santa Felicita shares a unique and unusual architectural feature unlike any other church in Florence. The power and influence of the Medici family is seen throughout the city. It was in 1564 that Grand Duke Cosimo I de Medici commissioned Georgio Vasari to design and oversee construction of what is called the Vasari Corridor. This elevated enclosed walkway was built to provide the Medici family and court to move between the family’s Palazzo Pitti on the Oltrarno to what is now the Uffizi gallery-at the time the offices (uffizi) of the Medici family business. 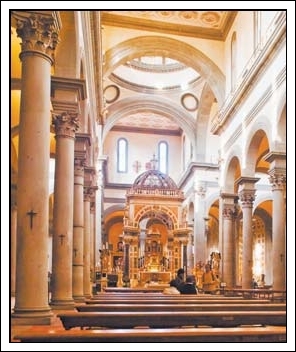 The final unique design of this church is the presence of an open gallery above the nave from which the Medici family could hear (attend) mass without having to mingle near or in churchgoers from the city. The most striking of the works of art in the church is Jacopo Pontormo’s Deposition, painted by commission of Ludovico Capponi in 1565 for his family’s private chapel within the church. The fresco was completed in 1568. 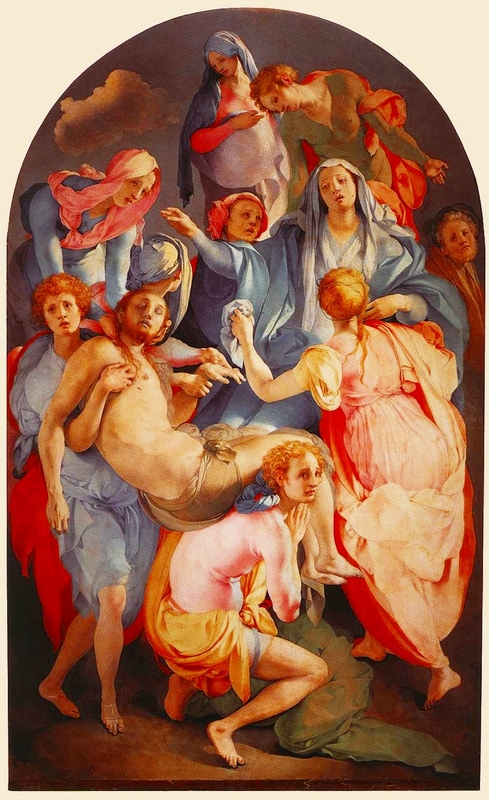 Pontormo’s vision of the deposition created an outcry among the Florentine artistic community. Gone were the conventions of cross and location of the grief-stricken in proximity to the cross. In their place was a work that focuses on Jesus’ mother, Mary. The swirl of figures around her, the placement of the body of Jesus in the lower left quarter of the painting and the use of unusual colors created a vortex of grief, unseen prior to this monumental work. It was the birth of the “Mannerist” style. 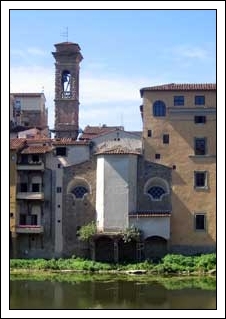 If you leave the Church of Santa Felicita and walk west, generally paralleling the Arno River, you will pass a small church along the Borgo San Jacopo. This narrow medieval lane is lined with buildings constructed after World War II. During the German retreat in 1944, the ancient buildings along this section of the river were destroyed. Time and loving care restored the tiny church of San Jacopo Sopr’Arno. arches that support the church are suspended above the Arno river, literally supporting a portion of the floor above the water. Heavily modified over the course of centuries, its most famous claim to fame is that Filippo Brunelleschi studied architecture in the structure and built (later destroyed) a small version of the dome that now towers over the city at the Duomo of Santa Maria dei Fiori. Please see “If You Go” below for information on hours and gaining access to the church. Not a great distance beyond San Jacopo is the Church of Santo Spirito, one of the last churches that Brunelleschi worked on. His plans for the building began in 1428. Upon his death in 1468 the responsibility for the completion of the building was given to others who had worked in Brunelleschi’s workshop: Manetti, Gaiole and Salvi d’Andrea. While the facade was never completed to Brunelleschi’s design, the simplicity of the facade seem appropriate, a moment of calm before visitors encounter the incredible collection of art housed within. Over forty side chapels, decorated by artistic commissions by different families of the city, line each side of the nave. 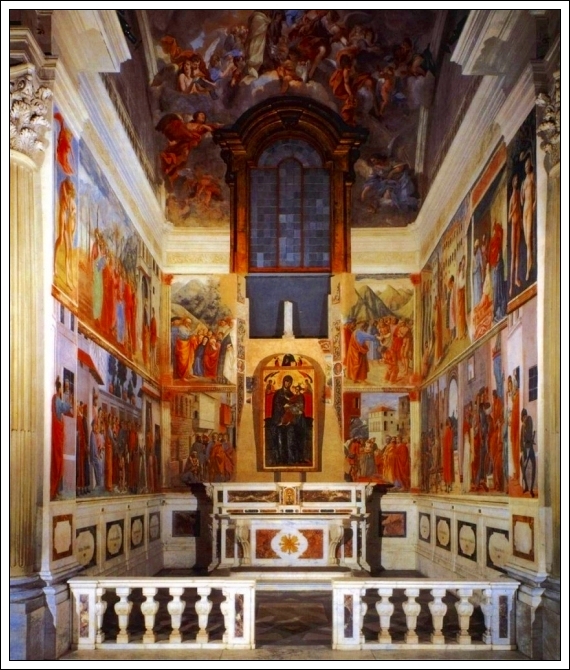 Works by the 15th century sculptor Rossellino share space with 14th Century Triptychs by Maso di Banco; frescoes by Andrea Sansovino in the Corbinelli Chapel occupy walls near a Doubting Thomas, a work attributed to the 15th century painter Neri di Bicci. This is yet another treasure of Florentine art contained within the walls of a seemingly unassuming church. Only a few minutes walk further west of Santo Spirito is Santa Maria della Carmine, which houses one of the most famous works of 15th Century Renaissance art in the city. The church was established in 1268 by a group of friars from Pisa who dedicated the church to “Our Lady of Mount Carmel”. The city of Florence provided assistance, along with wealthy families of the city, to support the cost of the church. The complex was consecrated in 1422, yet the building process continued until its 1475 completion. The facade of the Church is not finished. As with many other churches in Florence including San Lorenzo, only a brick and mortar wall greets visitors. The interior of the church was heavily damaged by fire in 1771 and was rebuilt in a Rocco Baroque style. What the fire did not destroy, and the art world is grateful for this seemingly supernatural intervention, were a cycle of frescoes painted by commission of Felice Brancacci a wealthy businessman. Two masters of early Renaissance art began work on this cycle in 1425, Masolino and Masaccio. After Masolino died, Masaccio completed three of the frescoes – Expulsion from Paradise, The Tribute Money St Peter Healing a Lame-Man, and St Peter Raising Tabitha from the Dead. 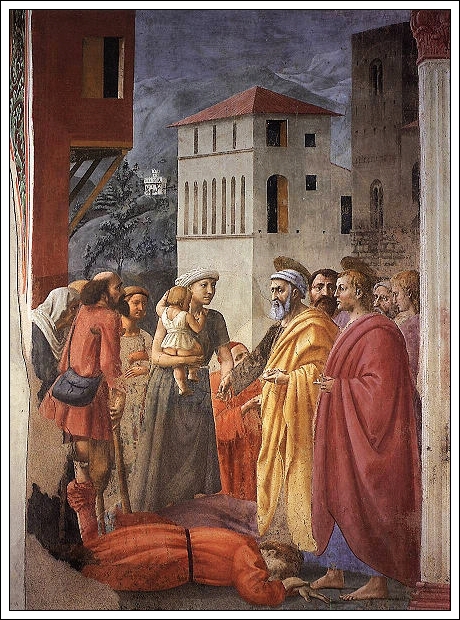 As with so many talented artists of the Renaissance, Masaccio’s life was cut short. He was called back to Rome, before the frescoes were done, where he died at the age of 27. The frescoes were completed by Fillipino Lippi, a student of both artists. Rather than attempt to describe what these artists accomplished, I have included a few photos of the works below. I let them stand on their own – as incredible evidence of talents that established the school of early Renaissance painting in Florence. To walk into this chapel, be surrounded by such incredible colors and beauty is breathtaking. So . . . when the crowds of the city overwhelm you, when the heat gets to be too much, or you simply wish to take in some of the lesser visited treasures of Florence, walk the Oltrarno. Surprises and pleasures await. Note: The church is now deconsecrated, and used for a variety of cultural events. If it is closed, the priest of Santa Felicita has the key. I think it’s the Brancacci chapel, no?